This article was excellent, explaining several issues regarding performance. It would be great if the next article abou ssd addresses durability and reliability. My main concert is the swap partition (Linux) or virtual memory file (Windows). I found an post in another website saying that this is not an issue. Is it true? I find it hard to believe. Maybe in a real world test/scenario the problem will arise. I hope AnandTech can take my concerns into consideration. I'm reading this about a day late - got my Patriot PE256GS25SSDR 2.5" 256GB yesterday since I'm bad about destroying hard drives. this drive, in a word, was excruciating. I'll be replacing it with one of your recommended drives today. Long time reader, first time post. I really liked the background story and appreciate how Anand delves deep into the the SSD's (as well as other products in other articles). Thanks for looking out for the little guy! 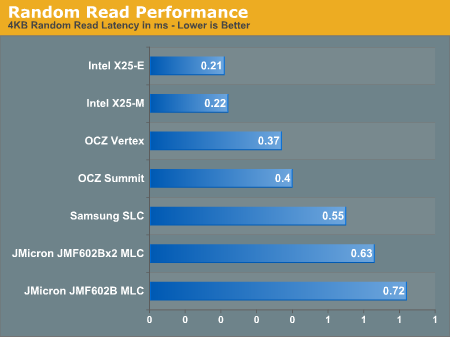 With Anand's excellent article, it's clear that the sequential read/write thoroughput doesn't matter so much - all SSDs, even the notorious JMicron series, can do a good job on that metric. What is relevant to our daily use is the random write rate. Latencies and IOs/second are the most important metric in the realm of SSD. Anand, This is a great Article and a good story too. The OCZ story caught my attention that a quick firmware upgrade make a big improvement. From my understanding that SSD system designers try to trade off Space, Speed, and Durability (Also SSD :)) due the nature of NAND flash. We can clearly see the trade off of Space and Speed when SSD is getting more full the slower the speed (This is due to out-of-place write to increase the write operation and a block reclaim routine). However, Speed is also sacrificed to achieve the Durability (by doing wear leveling). Remember SLC nand's life time is about 100K write, while MLC nand has only about 10K write. Without considering doing wear leveling to improve the life cycle of the SSD, the firmware can be much simple and easy which will improve the write operation speed quite a bit. I echo you that the performance test should reflect user's daily usage which can be small size files write and may not be 80% full. However, users may be more concern about the Durability, the life cycle of the SSD. Is there such a test? 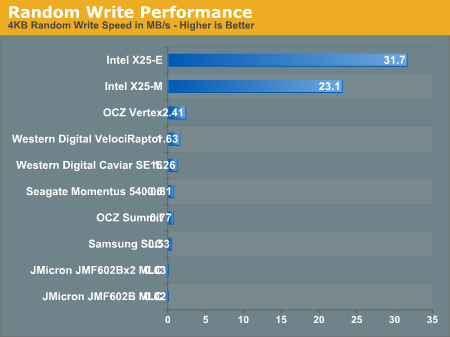 How long will the black box OCZ Vertex live? 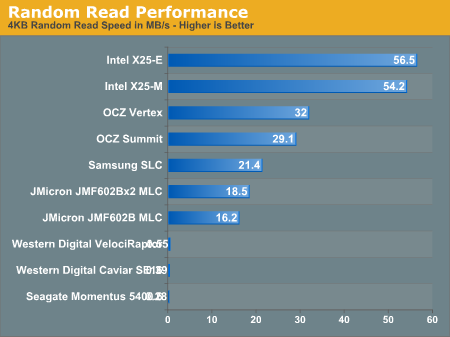 How long will the regular OCZ Vertex live? and How long will the X25 live? This is the first hardware review I've read from start to finish, and the time is well worth the information you've provided. As i read the article, i'm thinking of ways to slow down the down the degrading process. Intel is gonna ship x-25m 320gb this year. If i buy this drive and use it as an OS drive, i will obviously won't need the whole 320GB. Say i would need only 40 to 50 GB. I can make a secure erase (if the drive isn't new), made a partition of 50GB, and leave the remaining space unpartitioned. Will that solve the problem in any way ?